Convertibles have largely fell out of favor with the American buying public. It wasn’t that long ago that General Motors offered convertible versions of its compact sedans—remember the Cavalier and Sunfire convertibles? Imagine a Cruze convertible today. Those who seek a convertible from GM will need to shop the Chevrolet Camaro, but heed this warning: the Camaro convertible won’t operate the top in cold temperatures. Jalopnik reported last Thursday that the convertible top wouldn’t budge at a temperature under 40 degrees Fahrenheit. The previous day, it worked with an outside temperature slightly above 40 degrees. While top-down driving in brisk temperatures isn’t ideal weather for a convertible, it’s quite cozy with the heat running at full blast and wind in one’s face. Jalopnik reached out to Chevrolet to understand why the Camaro convertible gave a hard “no” to putting the top down. No, this isn’t another “blinker fluid” kind of joke. The hydraulic fluid works to operate the soft-top roof and store it away neatly in the trunk. We doubt that many owners want to ride around with the top down in chilly temperatures, but for those that live for a chilly morning jaunt, the Camaro is not the convertible for you. I previously owned a 1995 Cutlass Supreme Convertible in triple black, and currently we have a 2011 Saab 9-3 Aero Convertible that only comes out of the garage during perfect weather. Personally, I’d never even consider putting the top down at those temperatures. Yesterday we had an unusually warm 63 degrees, and I asked my wife if she was going to go for a ride, as it’s really her car. She looked at me funny and thought it was too chilly due to a cold breeze and not much sun. It has strong heat and heated seats, but wind chills are rough. Not a big deal. There’s much more urgent things to address regarding Camaro. Ford probably allows it, figuring owners will only do it maybe once per winter, just “because they can”. It probably won’t damage the system if done so rarely, but why risk it. Talk about a nothing sandwich. Forty-five seconds of my life I won’t be able to get back. Which is, coincidentally, about the amount of time to lower and then raise the top on my Camaro convertible. I wonder if the system allows the top to go UP at lower temperatures. What if a driver leaves the top down, comes back after the temperature has dropped, and wants to put it back up? Could make for a chilly and frustrating drive. This should be made clear in the manual, if it’s not already obvious. 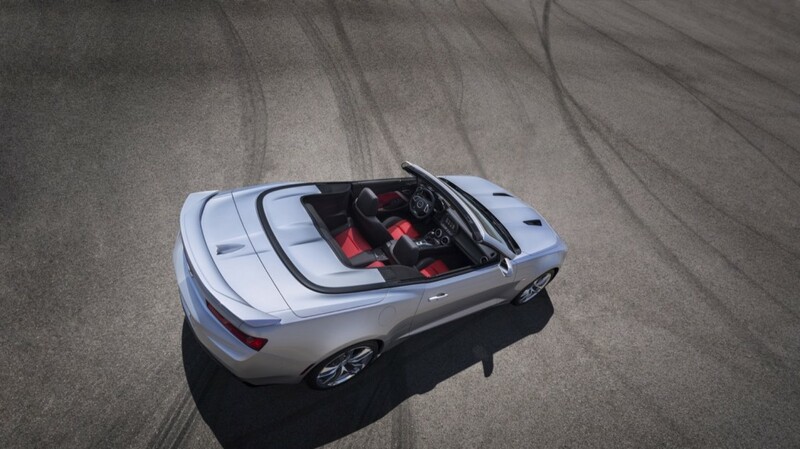 The manual states: At cooler outside temperatures, the convertible top may not open. It is possible to close the top down to temperatures of about 0 °C (32 °F). A DIC message will display if the top will not open due to low temperature. If necessary, move the vehicle to a heated indoor area to operate the top. I don’t want my vehicle trying to outthink me as the owner and driver. Guess that run counter to Mary Barra’s vision which reduces us to mere passengers in robotic cars. – No human can physically pump the brakes faster than ABS. – No human can countersteer and brake faster than a stability system that knows the intended path of travel of the car. – Seatbelt pre-tensioners are activated to pull you back into the seat faster then you can see the car that’s about the T-bone you. – DSG’s can shift far faster than any human with a manual transmission, and many have variable gear ratios that are optimized for fuel economy that no human could match with a manual. – Pre-collisions systems the brake long before you can see the danger because they can see in wavelengths of light that the human eye can’t even see. If you don’t want a car to out think you and that you can feel like you know better than it, then you need to find a car with no safety systems, no driver aids like power-steering or brakes, and no real advancements in technology or mechanical operation. Basically, you’re looking for a car from the 1900’s and no later, because then all that damn technology like automatic transmissions, safety glass, and electric starters come in thereby making you feel like the machine is out thinking you. Graw, systems that assist vs systems that impede: Some of the ones you mentioned (ABS) assist drivers while others, such as the one mentioned in the article, impede. Even ESP impedes more than it helps any decent driver who pays attention to what the car is doing. The old skip shift 6 speed also impedes, forcing a 1-4 shift under light throttle, bc it thinks it knows what is good for you. There is nothing like trying to climb a 12% grade on a slush covered highway when the stability control is cutting power and applying the brakes. That is why I find the visceral driving experience of vehicle from the 80’s and earlier so much superior. It’s all on the driver for better or worse. It is about skill and the command of the machine. Do the brakes still work when it’s cold? I am afraid the Camaro will be one of the next GM vehicles to be discontinued. I was at the LA Auto Show this weekend and reviewed a rather somber Chevrolet display. While there were several Silverados and Malibu’s and many SUV’s there was only 1 Impala, 1 Cruise hatchback, 1 Corvette and 1 Camaro on display. Not much promotion for these vehicles at all. In contrast, Ford had Mustangs everywhere, including no less than 3 Bullets. On my ’13 Silverado, the block heater won’t come on until -17C. If the built in thermostat in the cord stops working, I am supposed to get a new $400 cord. If I replace the thermostat plug with a plain plug, the truck may throw out a check engine code…How about GM letting me plug in my block heater any old time that I want to like I have been doing with my 8 previous vehicles. I’m guessing the real reason is because the top can potentially rip itself apart when Ice is built up in the wrong places. In the past, they would have worked on the top till it didn’t do this, now, GM is just a big lazy corporation. If Ford can make it work so can GM! FAIL GM. Perhaps the answer is for GM to have some guys drive up Mound Rd. to the Heritage Center and take a look at some mid 50’s to mid 60’s GM convertible top mechanisms which seemed to work fine year around!